This folding shooting table is made of high quality metal alloy and can be easily cleaned and stored. Portable photography shooting table that requires no assembly, ready to use when taken out from the box. Must have photography equipment for photographers on the go. Portable shooting table can be used with different photography lighting systems, even household lamp. Produce catalog like product photo with different backdrop and photography lighting system. Reduce object drop shadow with the translucent shooting table board in conjunction with background paper(background paper is not included). The translucent white plastic panel, 1 block, for two sides: a glossy, a scrub surface, both sides can be used, glossy side has slight effect reflection, scrub side is used for placing all kinds of small or medium size products on it for being photographed. The rails underneath give it a solid base and more options for lighting from underneath. Only shooting table, other products being displayed on the shooting table are not included. 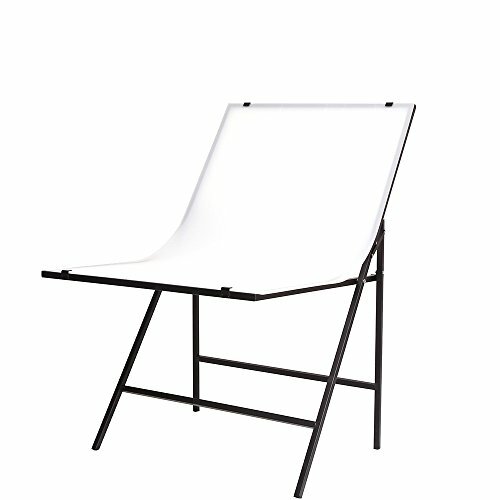 This folding shooting table is made of high quality metal alloy and can be easily cleaned and stored. Portable photography shooting table that requires no assembly, ready to use when taken out from the box. Must have photography equipment for photographers on the go. Portable shooting table can be used with different photography lighting systems, even household lamp. Produce catalog like product photo with different backdrop and photography lighting system. Reduce object drop shadow with the translucent shooting table board in conjunction with background paper(background paper is not included).